An employee at a food court in Seattle’s busy Center Armory last week sprang into action to help contain a man who had just violently stabbed a woman in public. 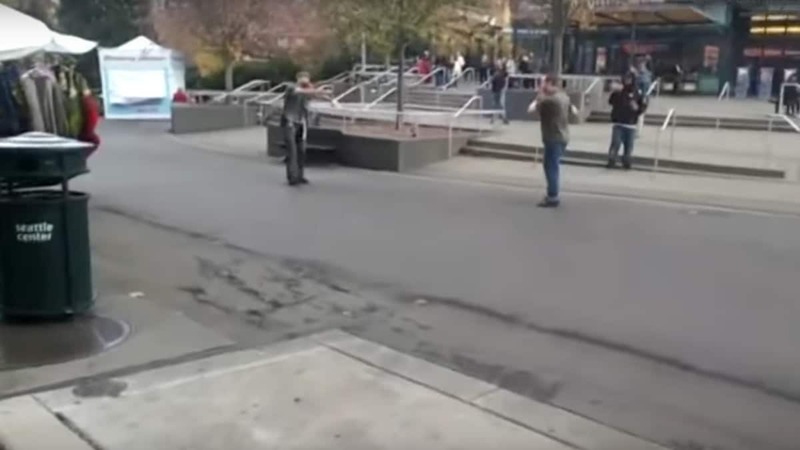 The exchange, shown in the above video from King 5 News, shows the employee — concealed carrier Scott Brown — holding his handgun on David Lee Morris just moments after the man allegedly stabbed Gabrielle Maria Garcia in the throat. Brown can be seen maintaining a gap between himself and Morris, holding his attention as the man continues to walk towards him through the crowded urban center. The subject shrugs off pepper spray from a bystander and resumes his interaction with Brown. Finally, police arrive and authorities move in to taser Morris, taking him into custody. Garcia, 28, was the mother of Morris’s five-year-old child, over which the two were arguing about custody. She was rushed to an area hospital but later died of her injuries, reports The Seattle Times. She had sought a temporary protection order against Morris last month, who is now under investigation for first-degree murder. Brown and co-worker Mike Carter had heard the commotion which caused the gun owner and carry permit holder to respond. Morris is being held in the King County Jail in lieu of $2 million bail and, reports KATU, is expected to be formally charged this week.